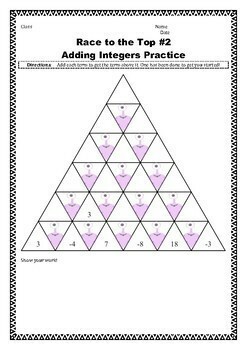 This contains 18 fun puzzles that require students to add or subtract integers to get a final answer. 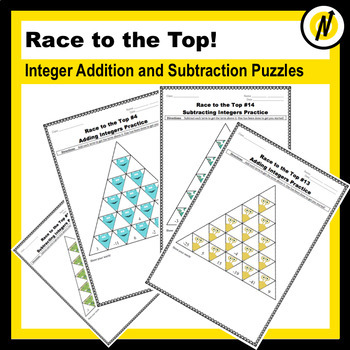 Start each class with a Race to the Top! Use your copier’s book-fold feature and create a small booklet of puzzles 1 – 16 (this feature would then print two to a page and front back – so 4 puzzles per sheet – 4 sheets of paper). 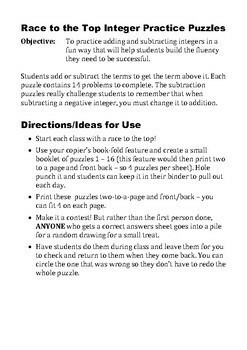 Hole punch it and students can keep it in their binder to pull out each day and do a puzzle. 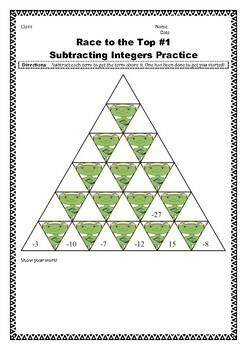 Print these puzzles two-to-a-page and front/back – you can fit 4 on each page. Make it a contest! But rather than the first person done, ANYONE who gets a correct answers sheet goes into a pile for a random drawing for a small treat. That way it’s not a speed contest! Have students do them during class and leave them for you to check as an exit ticket and return to them when they come back. You can circle where they went wrong so they don’t have to redo the whole puzzle.